Meagan Therriault and Geoff Pinard's driveway spills out almost directly beneath the Phase II power line. There’s an idea that a fisheries scientist came up with called the shifting baseline. It says that we take for granted whatever world we are born into. New Hampshire, for instance, is full of baselines that have shifted. “I mean a hundred years ago, New England was full of farms and there weren’t the vast forests that you think of in New Hampshire, Maine and Vermont, most of it was farmland,” says Ecological Historian Karen Alexander. This is perhaps why amid the uproar around Northern Pass, there has been little attention paid to the people already living with similar kinds of power lines. For many, these lines are already part of the scenery. 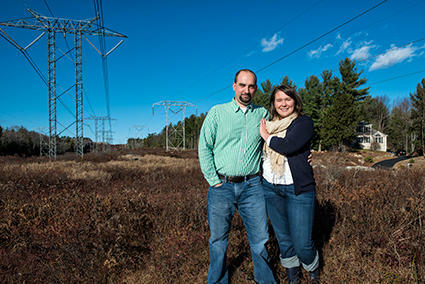 Nowhere is this more apparent than in Goffstown, where National Grid’s Phase II line – which uses the same technology proposed for Northern Pass – is about 300 feet from the back porches of a couple dozen homes. John Turner owns one of those homes and he doesn’t have a problem living here. “I grew up where our little league field was abutting power lines and I remember those spring days where we were playing baseball and you could hear the hum and the crack and the hiss of the power lines,” he says. But at the same time, that doesn’t mean he likes them. “I think what I have in my backyard, Every time I drive under them is an eyesore,” he clarifies. Turner’s house is in development that hugs the Phase II right-of-way, and making my way down the street, knocking on doors, nobody really seemed bothered to live near them. Of course, going to a development built underneath power lines obviously yields a biased sample, because anyone who really hates them won’t buy a house so close. These are folks whose baseline has shifted. But that’s Southern New Hampshire, where many have moved to get their kids in good school districts, or to be close to jobs. When you drive about a hundred miles North of Goffstown to Sugar Hill, you find folks who have a decidedly different baseline. Martland is standing at the top of a prominent sledding hill on the western side of Sugar Hill. At the bottom of the valley the current PSNH transmission line, constructed to bring electricity to the region here decades ago, is masked by the trees. She and other opponents say the impacts of the power line would be worse in the North Country, where there are more people who have moved North for the mountains and the views. 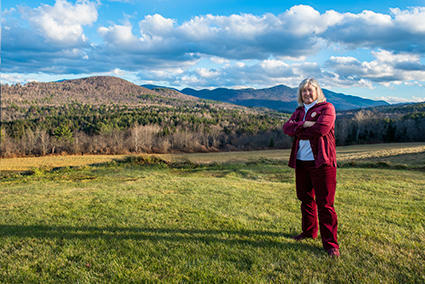 Nancy Martland stands atop a sledding hill, along the bottom of which the current PSNH transmission line is masked by trees. Surveys show that people like Martland who are around before a controversial power line is built, tend to continue hating it for a long time, much more strongly than newcomers. That’s perhaps no surprise. But that people like Martland exist in the same world as people who would happily buy a house next to a power line is emblematic of the fight to characterize the impacts of the Northern Pass project. One side of the debate loudly proclaims that the project would destroy New Hampshire’s scenery, fundamentally changing the character and culture of New Hampshire and driving away tourists and second-home buyers. While the other declares the project would eventually blend right in, and have no impact what-so-ever on the property values of abutting homes. It’s next to impossible to quantify to what degree some of these claims have merit, but the best proxy we have is property values: will people still be willing to come here? To bolster their claims, the project’s critics point to the experience of realtors in the North Country. “What we’re seeing now on a day-to-day basis is buyers choosing not to buy. It’s putting people into a horrible financial situation, because they can’t sell their property at any price,” says Andrew Smith, who has sold homes above and below Franconia Notch for 20 years. Smith says his firm represents about 20 properties that aren’t selling because they are near the proposed route. “The fear of the unknown is a huge impact right now,” he explains. But at the same time, there’s a large body of research that has looked at the effect that power lines have on property values, and it is by no means conclusive. “Some of the general findings and some of these may be somewhat counter-intuitive, but some of the studies found really minimal impacts on property values,” says Thomas Jackson a real-estate appraiser from Texas who has a Ph.D for his work studying these kinds of impacts. He says about half of the studies, done in different parts of the country often in sub-divisions and suburban areas, find no impact on property values despite the concerns of communities. “They have concerns, and I’m not discounting those concerns and perceptions, but a lot of times they don’t get born out in the marketplace,” he says. But sometimes there are impacts. A study of Canadian homes funded by Hydro-Quebec in 2002 found that in some scenarios homes can lose an average of 10 percent of their value. But it takes having a tower right in plain view of the front door. That’s the case for Meagan Therriault and Geoff Pinard’s house in Goffstown. They have a striking view of the transmission corridor, and their driveway spills out practically underneath the towers. “We couldn’t afford to be in this neighborhood if it wasn’t for this house, because of the fact that it was near power lines,” says Therriault. But in the same neighborhood, a half-dozen homeowners said they didn’t think they got a good deal in the slightest for buying a home near the power lines. “Back in 2005 the properties were limited. To buy something this size you had to buy where you could in this area,” says John Turner. The interaction between power lines and property values is by no means straight forward. A study often cited by Northern Pass finds that certain homes are more likely to take a hit to their value than others. Small, purely residential lots in markets with a many alternatives were observed to lose as much as 30 percent of their value. But on the other hand that same Hydro-Quebec study even found that some houses, ones that were on the right-of-way but didn’t have a view of the towers, even tend to sell for slightly more. The study’s author thinks this is because a view looking out onto an empty right-of-way has certain advantages. “They can go naked in their living room without being bothered by neighbors,” Francois Des Rosier elaborates. So to put it simply, and without providing any real conclusions, throwing up a power line might take a big chunk out of the value of certain homes, but many may not be affected at all. “There’s always a buyer for everything, and it just takes a little bit longer to sell homes that are near power lines,” says Hopkinton realtor Judy Hampe, who has sold homes near the Phase II line for over 20 years. She says the studies don’t tell her much. She drove me around to look at various homes she has sold that abut the Phase II right-of-way, and thinks there are so many variables – from the characteristics of an individual home to the kind of market it’s sold into – that impacts can only really be determined on a case-by-case basis. Phase II has been in service since 1990, and connects Des Cantons, Quebec to Ayer, Massachusetts. And simply, not everyone cares about seeing the pylons… not everyone has the same baseline. “I would say about fifty percent of the market really cares,” Hampe says after thinking on homes she has sold recently. So would the state get over Northern Pass if it were built? The answer is likely something along the lines of — some would, some wouldn’t. “We seem to be capable of getting used to a lot — things that we people couldn’t even imagine,” says Karen Alexander noting that fights over many big developments, like the highway through Franconia Notch, have come and gone and been all but forgotten. Tomorrow, we’ll continue looking at these questions. Namely, where will New England’s power be coming from in the future. SEC Public Meetings: Should Citizens Have A Role In Approving Utility Projects? A series of public meetings begin the first week in December to determine what changes, if any, should be made to how the state’s Site Evaluation Committee works, including whether the public should have a decision-making role in approving new utility projects. The SEC reviews major utility projects, which will include Northern Pass. Currently the SEC has fifteen members, all from state agencies. It began on about 135 acres of land in Dalton. The land is owned by Sandy and Jim Dannis, who were attracted by its classic North-Country splendor and its lost-in-time seclusion. Standing in the middle of a hilltop field - with a spin-around 360-degree view - Jim Dannis turns and turns. “It is a beautiful exposure,” he said. But now it has become the center of a new Northern-Pass controversy, one that opponents of the project worry has ominous implications for the state.